The advertisement says ‘Offer valid till stock lasts’ but how much is the stock left when this scheme is pretty much valid since June? 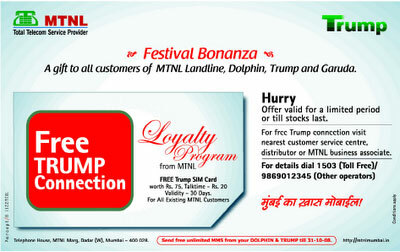 Anyways, overlooking the marketing ploys here, if you’re in search for a new number then MTNL is giving away a prepaid number for free to its existing MTNL Landline/Trump/Garuda/Dolphin users. Customers will get a Trump SIM card with a 30 day validity and Rs. 20 worth of talk time.